Going far out with our latest digital designs inspiration To The Moon. 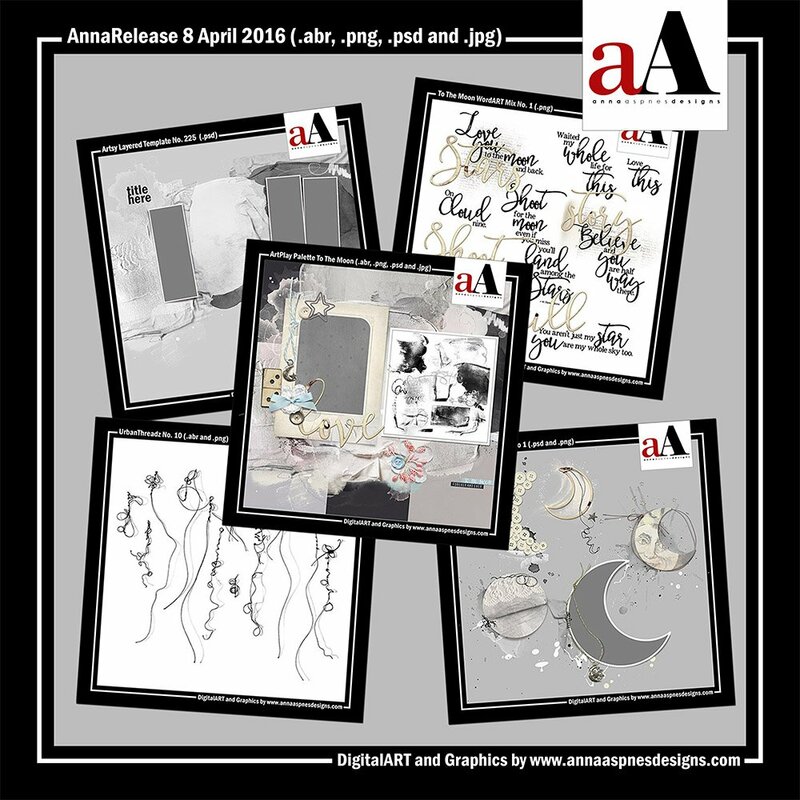 AnnaRelease To The Moon is the latest collection of digital designs for scrapbookers, photographers, artists and crafters to be released in the Anna Aspnes Designs store. 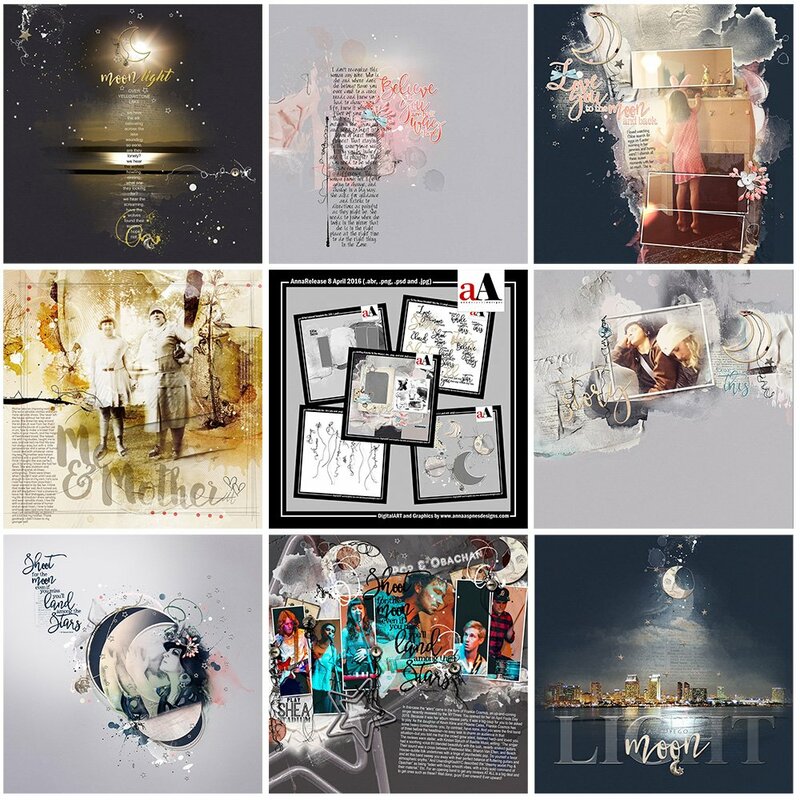 The aA Creative Team are have been getting artsy with their digital artistry and scrapbooking using ArtPlay Palette To The Moon and supporting DigitalART products. Digital art inspiration for AnnaRelease To The Moon can be found in the AnnaGallery. View all the digital art products found in AnnaRelease To The Moon and save almost 50% for a limited time. 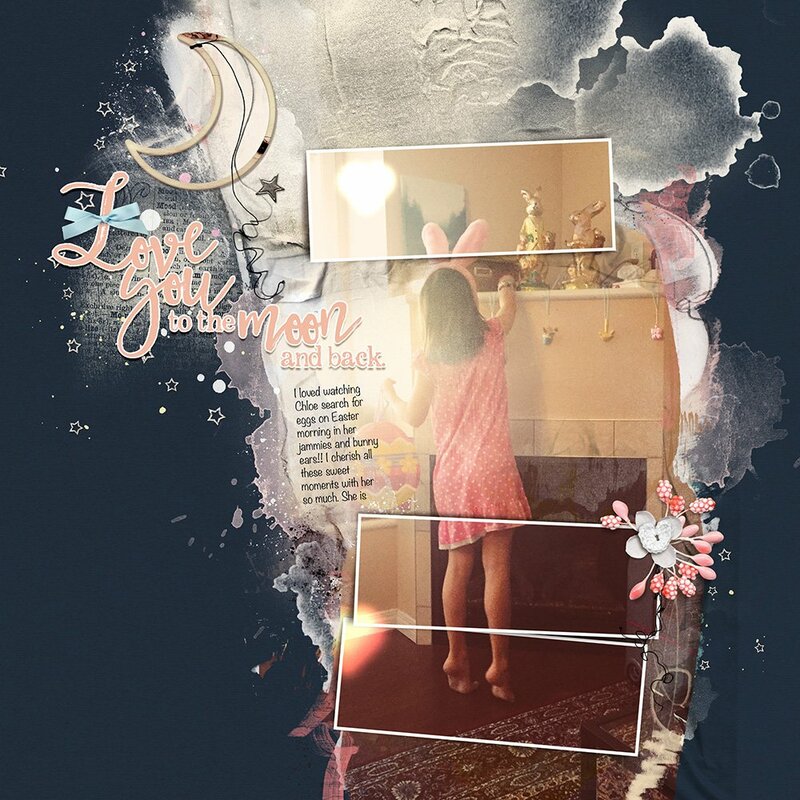 Click on the image below to view more Digital Scrapbooking Designs Inspiration To The Moon or visit the AnnaTeam Layouts board on Pinterest. An extraction describes the process of tracing around the subject in your photo using the Magnetic Wand or Quick Selection tools then removing the background. Create an extraction and add dimension to the resulting image by following this Create Extractions and Cast Shadows tutorial by Miki Krueger. The Moon frame element in MultiMedia Moons No. 1 is the perfect foundation for an extracted image of a sitting subject as demonstrated by Linda Davis. Blend a night Cityscape shot onto the dark colored solid background paper in ArtPlay Palette To The Moon using the Inverted Masking technique outlined in AnnaBlendz LIVE. Add sparkle using elements from MultiMedia Moons No. 1. 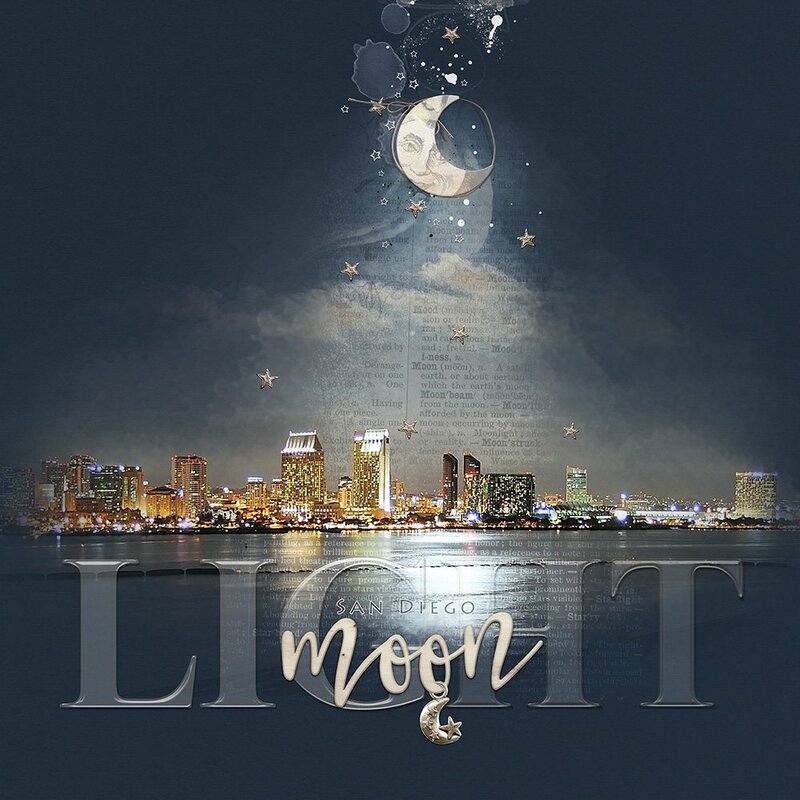 Notice the elegant central placement of the moon and title work by Joan Schaefer. Split your photo using multiple frames and masks as demonstrated by Heather Prins. Rotate Artsy Layered Template No. 225 to suit the orientation of your photo. Select the first framed mask in the template by clicking on the corresponding layer in the Layers panel. Open and move the photo of your choice onto the template so that the photo is placed directly above the mask layer. Ensure that the photo also covers all other masks in the template. Clip the photo layer to the framed mask layer. Press CTRL + ALT + G (Adobe Photoshop) or CTRL + G (Adobe Photoshop Elements) on your keyboard. Duplicate the image, move the copy layer up/down the layers stack in the Layers panel and position directly above the next mask. Repeat the clipping mask process. Duplicate photo 2 more times and clip these layers to the remaining framed mask layer and the paint/ blended mask layer in the template to complete the effect. 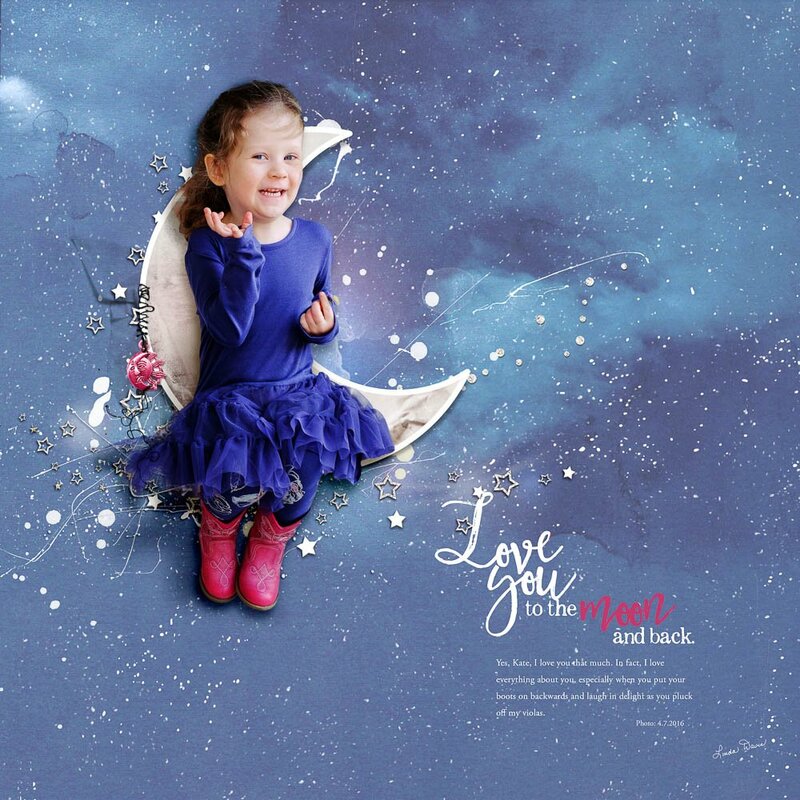 How will you use this digital designs inspiration To The Moon in your next layout?